The chemical properties of water. 2D representation on the right and 3D on the left. 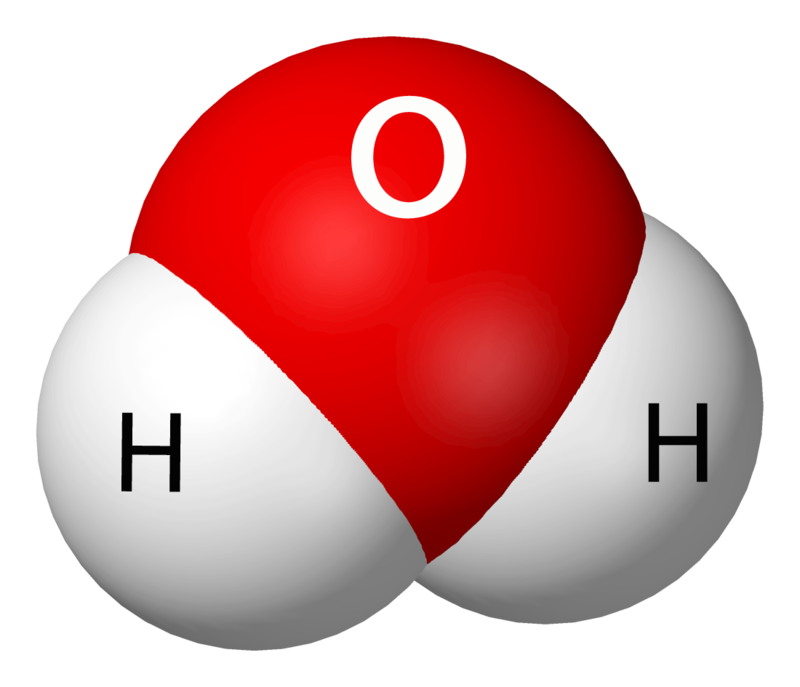 A molecule of water is V-shaped because oxygen is greedy for electrons. It tends to pull electrons towards it and away from the hydrogen atoms. Hence, one end of the oxygen is slightly negatively charged and the other end with the hydrogen atoms is slightly positively charge. The two ends of a water molecule have opposite charges. Due to this polarity, the positive hydrogen of one molecule is attracted to the negative oxygen of a different molecule forming a weak bond called hydrogen bond. Water molecules form hydrogen bonds between one another. This causes them to stick together. 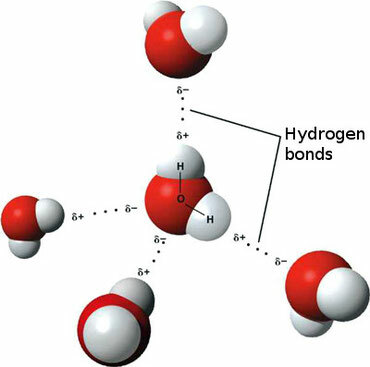 Hydrogen bonds in water are considered very weak because they are constantly forming and breaking. So, while some hydrogen bonds are being formed, others are being broken. The hydrogen bonds in water result in what is referred to as Cohesion. Cohesion is the attraction between molecules of the same substance such as the attraction between two molecules of water. Adhesion on the other hand is the attraction between two different substances such as water and glass. Water has a high cohesion. You can see this property when you look at how water behaves on leaves or waxy surfaces. Water adheres weakly to the leaf. The cohesion between water molecules is stronger. 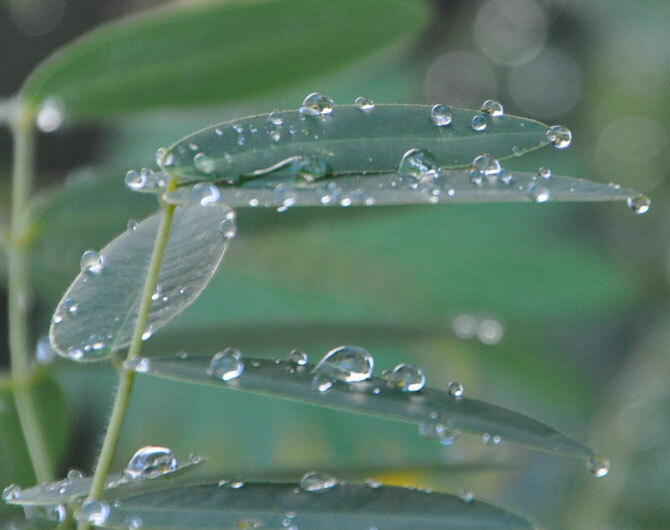 Water beads up on a leaf because its molecules hold each other together forming the least surface area. Water has a high adhesion to substances like glass. This means that the cohesion force in water is weaker than the adhesion force between water and glass. This causes water on a piece of glass to spread out rather than bead up. When talking about the surface tension of water we look at the surface of water. The cohesive force between water molecules here is stronger then the adhesive force between water and air. This forms a kind of ‘skin’ on the surface giving water a high surface tension. 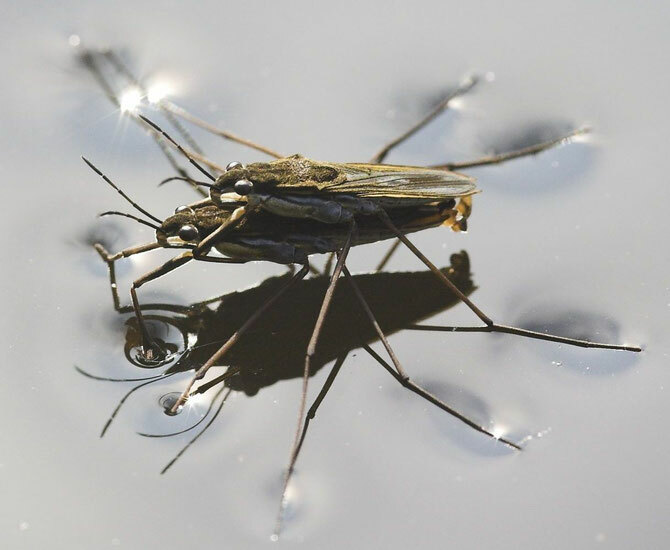 This allows some insects and a lizard to be able to walk on water. The high surface tension of water makes cool things to happen. Another interesting property of water is capillary action. This behavior of water defies gravity. You can see the effect of capillary action if you put a very thin glass tube into a cup of water. Put the glass tube just below the surface of the water. You will notice that water will start to climb up the tube. It will continue to do so until the weight of water in the tube is enough for gravity to prevent it from rising any further. The strong adhesion between water and glass causes water to climb up the tube. The meniscus is caused by cohesion, pulling down on some water molecules. Capillary action is how plants get water from their roots up to their leaves. Water is a very powerful solvent. It dissolves more substances than any other substance on the planet. Thanks to this property of water you have no problem taking your coffee or tea with some sugar. Salt and sugar are hydrophilic – this means that they are water-loving. This is because they are polar substances (have charged poles). Their polarities are stronger than the cohesion between water molecules. Instead of bonding with each other, water molecules will form hydrogen bonds with molecules of polar substances. Table salt (NaCl) is ionic. When placed in water, it gets separated into its constituent ions. As the charged poles of water interact with NaCl, it pull away the sodium ions (Na+) and the chloride ions (Cl-) dissolving the salt. On the other hand, water-repelling or hydrophobic substances behave differently in water. They are non-polar (lack charged poles) and tend to stick together in water. This is because the cohesive force in water is stronger than the adhesive force between water and non-polar substances. An example of a non-polar substance is oil. You can create a demonstration of how water interacts with a non-polar substance by mixing some oil in water. You will notice that oil tend to stick together in water. It’s pretty normal to see a piece of ice floating on water. What is interesting here is that the solid form of everything else will sink in its liquid form. Ice is less dense than liquid water. When water starts to solidify, its atoms begin to form crystalline patterns that cause it to expand. Some people refer to this as the anomalous expansion of water. This phenomenon is responsible for bursting your pipes in the winter. 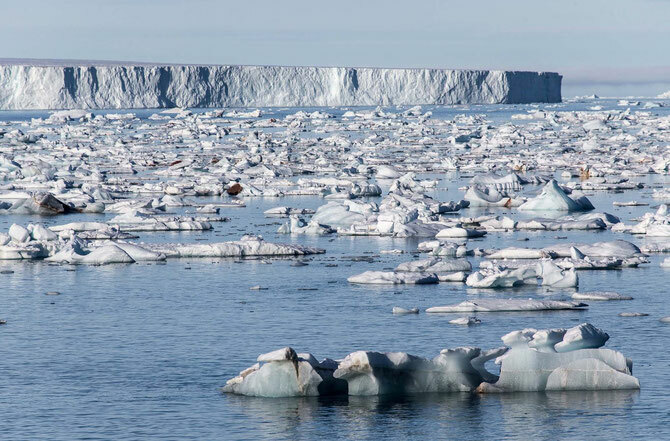 If ice was denser than water then all the ice at the poles will sink and maybe the titanic wouldn’t have sunk when it did. Water has a very high heat capacity. It is great in holding onto heat. It takes a great deal of energy to change liquid water to vapor. The human body uses this peculiar property of water to regulate body temperature. When your body gets hot, you sweat. Your body heat excites water molecules on your skin breaking hydrogen bonds in water. This allows water to escape your skin taking with it lots of heat, leaving you cooler.